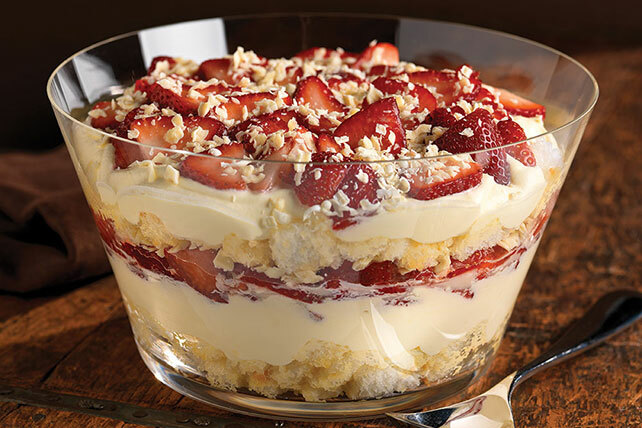 Our Twisted Strawberry Shortcake looks a lot like a trifle—layered with fresh berries, pudding, citrusy angel food cake and white chocolate. Beat pudding mixes and milk in large bowl with whisk 2 min. Gently stir in COOL WHIP. Place cake cubes in large bowl. Drizzle orange juice over cake, then toss to coat. Place half of the cake cubes in deep glass serving bowl; cover with layers of half each of the pudding mixture, strawberries and chocolate. Top with layers of remaining cake cubes, pudding mixture, strawberries and chocolate. Refrigerate at least 30 min. before serving. Store leftover dessert in refrigerator. Substitute orange-flavored liqueur for the orange juice. Please use alcohol responsibly. Prepare using BAKER'S Semi-Sweet Baking Chocolate. Or, substitute your favorite drained canned fruit for the sliced fresh strawberries. Warm chocolate in the microwave on MEDIUM (50%) 15 sec. to soften slightly before grating.